"Had we lived I should have had a tale to tell of the hardihood, endurance and courage of my companions, which would have stirred the heart of every Englishman. It seems a pity, but I don't think I can write more. These rough notes and our bodies must tell the tale.... For God's sake, look after our people." It is with these words, found carved on the cross that marked the place in the frozen wilderness where they were found, we begin our look at the man, the place and the intensely brilliant 1948 Ealing film, produced by Michael Balcon and directed by Charles Frend, Scott of the Antarctic, with an evocvative, beautiful and haunting soundtrack, composed by Ralph Vaughan Williams. Let us now hand you over to the author, George Perry, from whose book Forever Ealing, the description of the film, below, is taken. 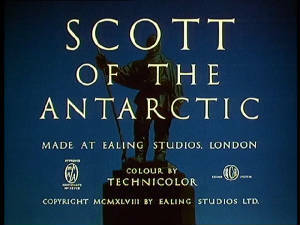 Get hold of this book, if you can, it stunningly brings to life everything and everybody that was Ealing Films, of which Scott of the Antarctic is one of the finest examples, if not the finest. It was made in Technicolor, with Jack Cardiff, Osmond Borradaile and Geoffrey Unsworth in charge of photography. The script by Walter Meade and Ivor Montagu, with sequences by Mary Hayley Bell, leaned heavily on the diaries and Arne Akermark's art direction gave as authentic a look as possible to the sets and props. 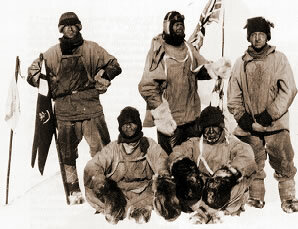 As historical reconstruction it looked impeccable, although it has to be said that there were difficulties in getting approval from all the survivors of the expedition, particularly Lord Mountevans, formerly Lieutenant Evans, who had objected to his namesake and companion, Petty Officer Evans, being chosen by Scott for the final dash to the Pole. John Mills played Scott, a popular choice as he had established his reputation portraying level-headed, stiff upper-lipped men of courage. The supporting cast included Harold Warrender as Wilson, Derek Bond as Oates, Kenneth More as Lieutenant Evans, James Robertson Justice as Petty Officer Evans, Reginald Beckwith as Bowers and Diana Churchill as Scott's wife. 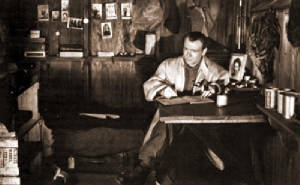 Location photography was shot in Grahamland, Switzerland and Norway - in the first, which was in Antarctica itself, without any actors. In addition, there were many hazardous scenes filmed at Ealing on a sound stage covered in 'fluff', as the revolting artificial snow was called. Because of the difficulties of location shooting it had been decided to use the then new Technicolor monopack system which did away with the cumbersome three-strip camera, and their seventy pounds of film magazines, but it was not so easy to get the new stock from America. The beautiful documentary footage shot on the original expeditions on black-and-white nitrate stock by the great Herbert Ponting was studied closely and some shots were even accurately duplicated. 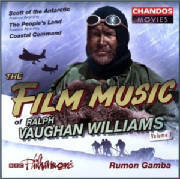 The final touch to enhance the picture's prestige was the vibrant, atmospheric score by Ralph Vaughan Williams, one of the composer's rare and most successful forays into film music, and a triumph for Ealing's musical director, Ernest Irving. Although there is a tendency nowadays to scoff at hagiographies of national heroes, it would be unfair to deny Scott of the Antarctic its excellence. It is a cool, carefully-stated account, which does not flinch from showing the casual, gentlemanly way in which Scott made his plans, leaving far too much to chance and good fortune than was prudent for a determined explorer. He had the ambition, but not the ruthlessness. Extract© George Perry: Forever Ealing. written as he "faced the inevitable"
an inspiration for future generations." and around the Antarctic continent. scientists from around thirty countries. "Scott Caught By Cold Snap"
in 1912 if it were not for a freak cold snap.